The EventLITE 6/3 is the ideal solution for adding some flair to your events. Due to its built-in battery and Wireless DMX module (from Wireless Solutions) you do not need any cables and can use it for at least 6 hours depending on the color scheme you are using. The powerful 270 degrees tiltable LED head makes it possible to project your beam to almost every position. 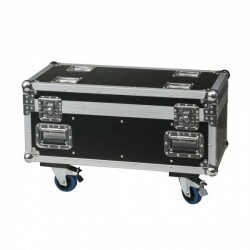 The EventLITE is very compact and lightweight. It includes automated and sound activated programs, can be daisy -chained in master-slave mode, and can be customized manually, by optional IR-remote controller or (wireless) DMX. A raincover is available for temporary outdoor use.